For several years I’ve chosen a “word of the year,” intending to use the word to focus my attention, or at least frame my experiences. In 2018 I chose the word “FUN!” My hope was to add more whimsy, more play into my making. Did I succeed? Sure, probably. Somewhat, at least! 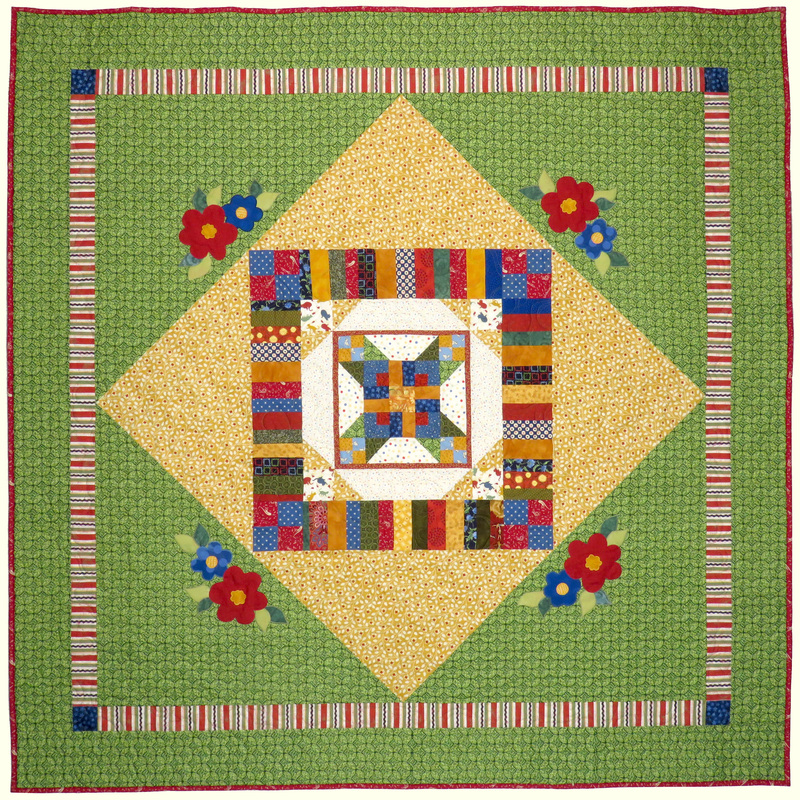 I made a bunch of quilts, some that inspired and delighted me, and others that felt less engaging. I’ve already showed you pix of three for which I enjoyed both process and outcome, and I’ll add in the table runner I finished early this month. Click any photo to open the gallery and see more detail. 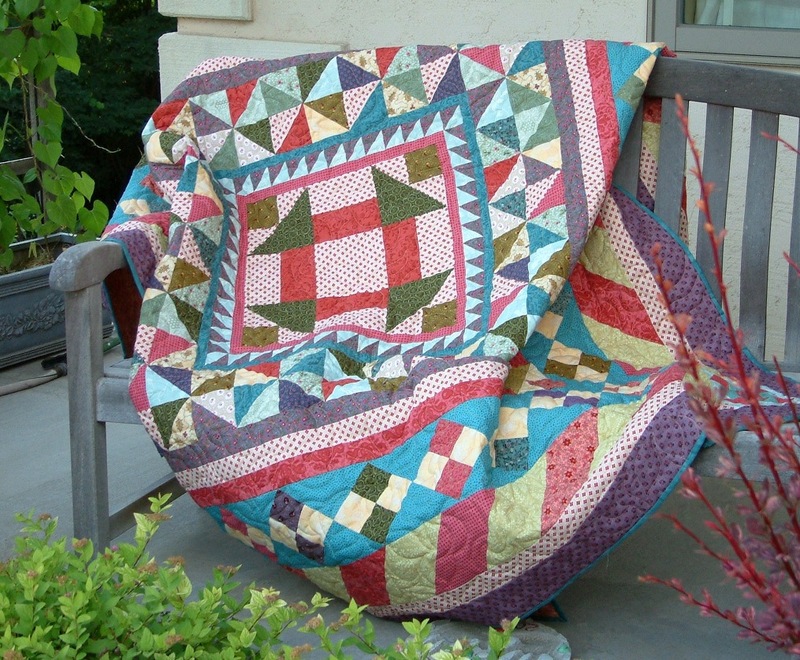 This entry was posted in Quilting and tagged Christmas letter, Fun, Word of the year, Year in review on December 27, 2018 by Melanie McNeil. I wrote recently about masks and other faces in the National Museum of Mexican Art in Chicago. Depictions of faces are one of the most common types of visual art, because we humans find faces fascinating. They are so interesting that we often perceive faces in almost any combination of shapes, in any media. And I do mean any media, including Swiss cheese, bowling balls, and on bug bodies! This article in Mental Floss magazine says the phenomenon of seeing faces everywhere is called “pareidolia,” and it is a function of a healthy brain. Human brains are exquisitely attuned to perceiving faces—in fact, there’s an entire region of the brain called the fusiform gyrus that is dedicated to it. Its functions are evident even from early childhood: Studies have shown that shortly after birth, babies display more interest in cartoon faces with properly placed features than in similar images where the features are scrambled. Well, no, that’s not a face. (I’ll bet I could find one if I look.) But I did several more cuttings, and this simpler cut-out shouted FACE! to me. For months this piece of paper has been floating around my studio, sometimes “put away” and sometimes in a stack of other paper cuttings on my counter. For months I’ve wanted to create a mask from it, but until recently I wasn’t really sure how to do that. If you have spent time around children, you might know that both toddlers and teens can be cross a lot of the time. My theory is that it has a lot to do with them being ready in some ways for the things they want to do, but not fully capable in other ways. They get frustrated in their desires, which makes them cross. Though I haven’t been particularly cross about it, my desire to make a mask from the paper cutting didn’t match up with my skills. Now it does. I chose fabrics first and ended up with a completely different color set than I’d expected. That’s okay, right? With a background of brilliant gold-yellow, I chose a deep burgundy to provide the framing. I adhered Wonder-Under fusible web to the burgundy (and no, I don’t use affiliate links or payments, so this isn’t an ad.) 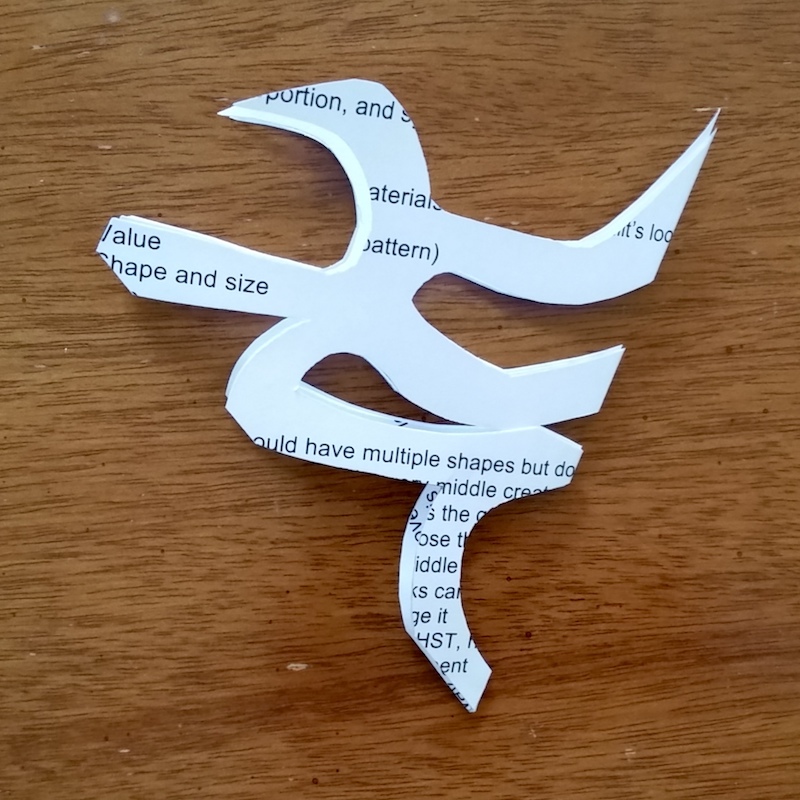 Next I traced the shape on the web paper in pencil, and carefully cut it out with small, sharp, scissors. 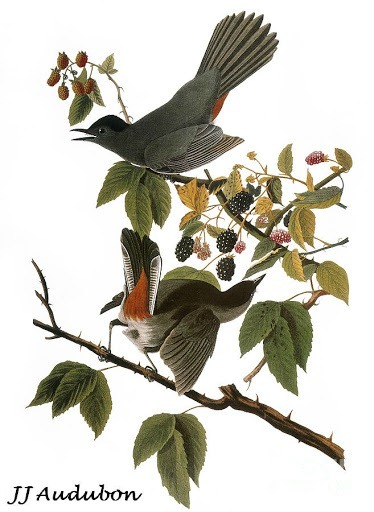 Click either picture to see detail better. 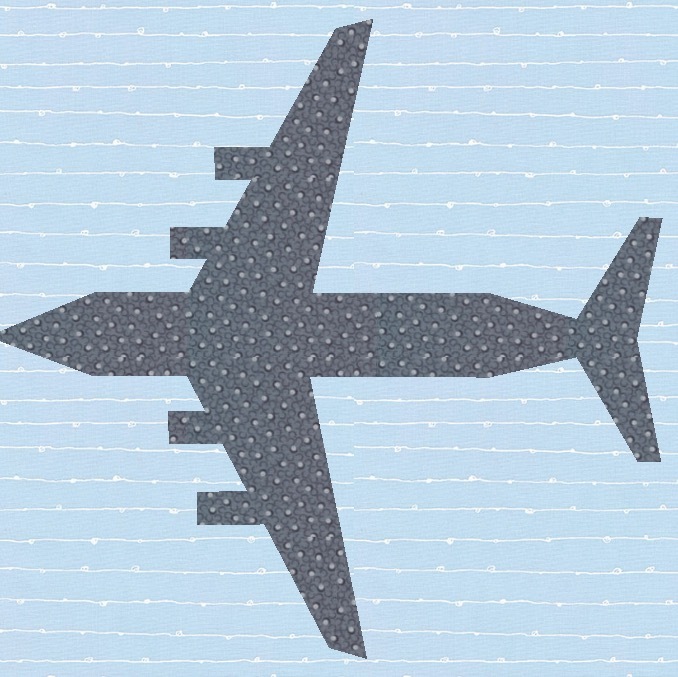 Paper cut-out with the shape of the fabric frame. Neither is adhered to the background. Now the frame is cut. Fusible web paper is still on the back, to help it keep its shape. As I chose the features for the mask — eyes, nose, teeth — I added them one at a time, using parchment paper as my pressing sheet. I pulled the paper away from the fusible on the burgundy mask framing, just for the part I was about to adhere. While fusing shapes together, I left as much of the fusible paper on the framing as I could, to maintain the stability of the shape and avoid damaging the fabric. With the paper removed from the feature (eyeball, for instance,) I placed it behind the framing and ON TOP of the pressing sheet, and pressed the edges together. After the fused pieces were cool, I could peel them away from the pressing sheet as one unit. I continued to build the face, adding more features as I went, and then adhered the whole thing to the gold background fabric. Now the features are adhered under the frame and the whole thing is pressed to the gold background. The background isn’t attached to the batik print around the edge. In the last photo you see it lying on top of a piece of batik. I might frame it with that, or I might choose a different border arrangement. Those are decisions I haven’t made yet. 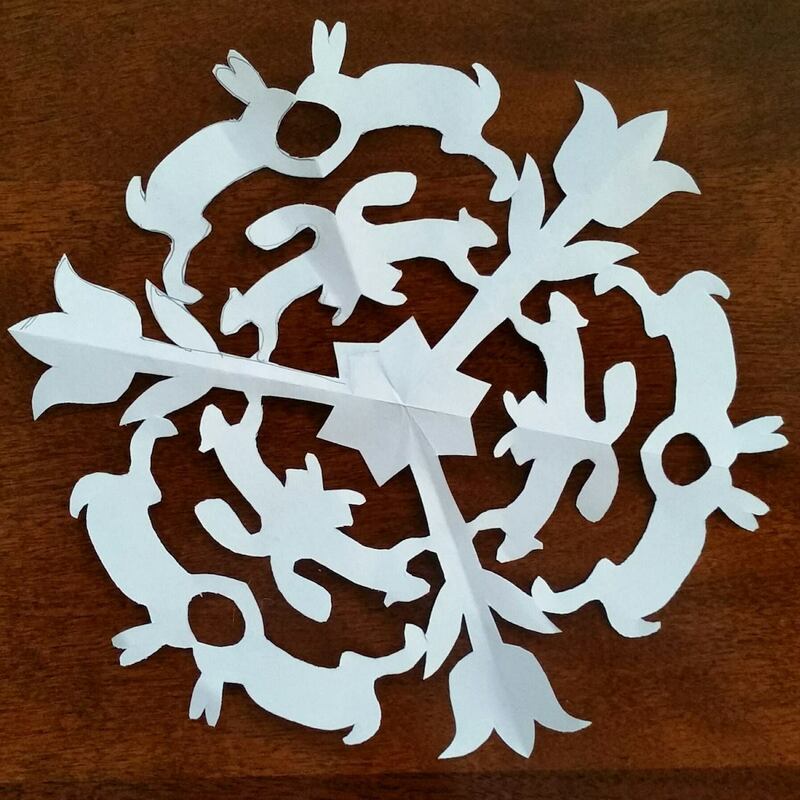 If you’d like to try six-pointed paper cut-outs, whether to make snowflakes or to make a mask, this is a reasonably good video of the process. You should note, though, that my “snowflake” has six SIDES, while the video shows how to make a six-POINTED snowflake, with twelve sides. 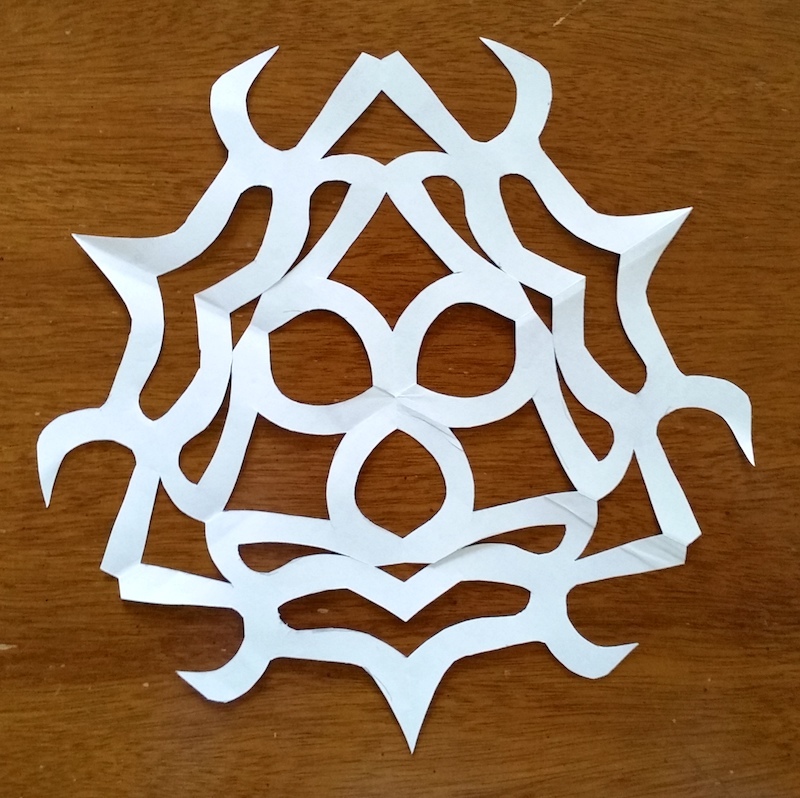 Here is my mask paper-cutting refolded into sixths, not twelfths as their snowflake is. The difference in construction is that they’ve folded the paper an extra time. While it allows a more intricate pattern, it’s also substantially harder to cut cleanly. Try playing with some plain copy paper to see what pleases you more. 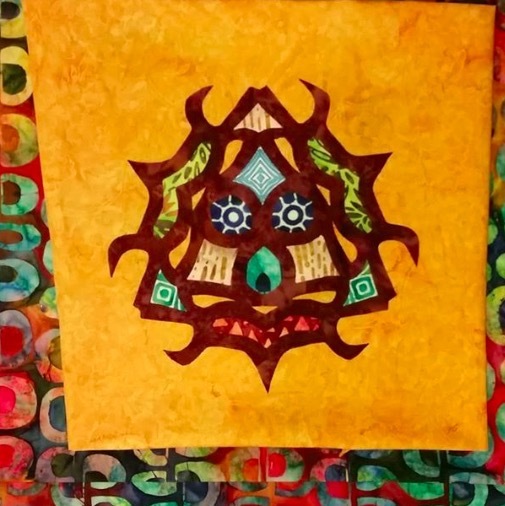 This entry was posted in Creativity, Quilting and tagged Faces, Fun, Mask quilt, Masks, Paper cutting, Paper snowflake, Pareidolia, Process on August 22, 2018 by Melanie McNeil.